While Nicki Minaj and Meek Mill have a date night, Rihanna and Chris Brown were spotted hanging at the same party. 1. 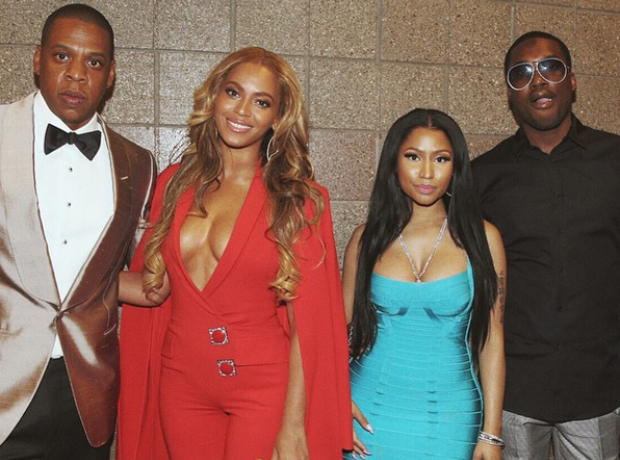 Beyonce, Jay Z, Nicki Minaj and Meek Mill hung out during Fight Night in Las Vegas. 2. Nicki Minaj and Meek Mill hit the tables while they were there, did they win though? 3. Here's a selfie the newly engaged couple took during their car journey. 4. Big Sean and Kanye West were hanging out, possibly shooting a video together. 5. Ciara received an invitation to the White House and wondered off to have a look around! 6. Which was fine, because Chrissy Teigen was keeping Barack and Michelle Obama busy. 7. Rihanna was enjoying her holiday in Hawaii and making everyone jealous with these photos. 8. Rick Ross showed off his amazing weight loss. Where's Rozay gone!? 9. Rihanna went to Travi$ Scott's birthday party and posed with this huge snake. 10. Chris Brown was also at the party.